I Scream, You Scream … Let’s All Scream for KC Ice Cream! Glacé Artisan Ice Cream (4960 Main St., KCMO; glaceicecream.com): This Kansas City establishment was founded by chocolatier and pastry chef Christopher Elbow, so you know it’s delicious! But don’t just take our word for it, Glacé was voted the best ice cream in Missouri by PureWow. With creative flavors like rosewater vanilla, lavender honey, banana caramel, goat cheese and cherries, and, of course, Christopher Elbow dark chocolate, you’re sure to find something scrumptious to tell your friends about. Betty Rae’s Ice Cream (7140 Wornall Road, KCMO; Bettyraes.com): Creative, rotating flavors and homemade waffle cones … need we say more? TripAdvisor selected Betty Rae’s as one of the top “Ice Cream Shops Worth Traveling For,” in 2017. This ice cream shop features 24 house-made flavors and is fun for kids and adults. There are almost too many choices, including sundaes, ice cream sandwiches, floats and shakes – and don’t forget to bring your ID in case you want to try the adult “boozey” floats and shakes, including the KC Bier CO Dunkel float and the Mint Chocolate Julep shake. Westport Ice Cream Bakery (4120 Pennsylvania Ave, KCMO; www.icecreamkc.com): This “bakery” offers handcrafted ice cream, yummy fresh-baked treats and authentic Italian ice, for starters. 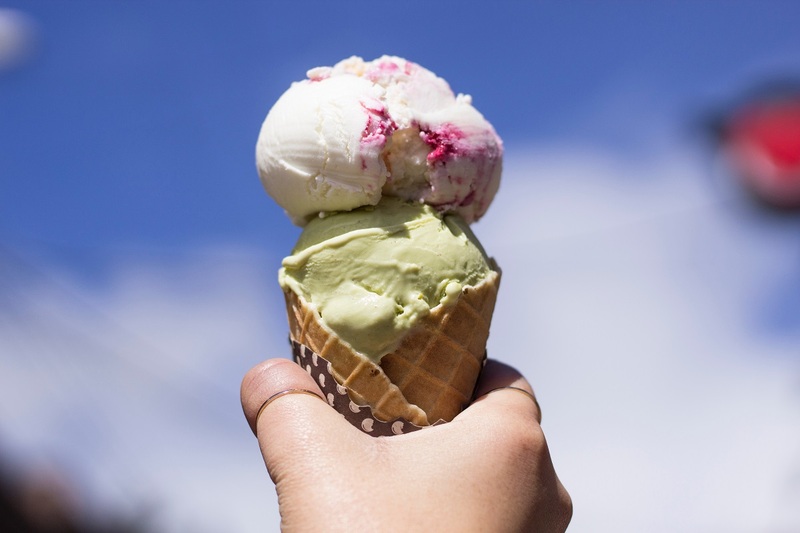 All of the delicious ice creams are handcrafted in-house using real, fresh, and locally sourced ingredients, guaranteeing the freshest, sweetest and highest-quality treats available. The owners donate a portion of their proceeds to various local charities, so Kansas City families can feel good about indulging in a treat from Westport Ice Cream Bakery. Flavors change daily, but a few favorites are red velvet, cookie monster and ghost pepper chocolate. Are you salivating yet? Paleterias Tropicana (4 locations: Olathe, KCMO, KCK and KU Med Center; www.facebook.com/PaleteriasTropicana18st): You may not have tried Tropicana yet, but it’s worth the trip for ice cream connoisseurs. Feast magazine said “Paleterias Tropicana is building an ice-cream empire in Kansas City,” and they might be right. This establishment specializing in fresh-fruit popsicles and homemade ice cream is owned and operated by husband-and-wife team José Luis Valdez and Lucia Fonseca. They offer 48 flavors of Mexican paletas – ice pops – made with just fresh fruit, white sugar and water or soft-serve ice-cream mix. They’re all made with products imported from Mexico and using traditional recipes, Valdez says. According to Feast, the flavors will transport you to Mexico: “creamy pistachio flecked with ground nuts; an off-white guanabana; a golden mango with bite-sized fruit pieces; rice-studded horchata and sweet-and-sour tamarind with chiles.” Tropicana also offers the old standbys, including strawberry, chocolate and vanilla, but where’s the fun in that? Miami Ice (1624 W 39th St @Genessee St., KCMO; www.facebook.com/miamiicekc): It’s a little taste of Miami in Missouri, and this long-time family-owned favorite isn’t shy about its inspiration. The first thing that catches your eye is the pink and teal “Miami” décor, but the treats will tempt your taste buds. From Westport, Miami Ice serves up shaved ice, frozen custard with mix-ins, and other tasty cold treats. The 20-plus flavors are varied, but decidedly tropical: guava, Hawaiian, coconut, tangerine, lemon and blue raspberry. And surprise! The shaved ice comes with custard on the bottom. The ice cream is delicious, too, Miami Ice fans rave about cotton candy, cinnamon and coffee flavors. Our team here at Team Real Estate Kansas City unabashedly loves ice cream, and also would love to help you buy or sell your Kansas City home! We’re proud to provide the best client-centered experience for Kansas City families, and we’re the No. 1 real estate team in Kansas. Call on us to help you buy or sell your home, 913.451.5711 or teamre.com, or answer questions about the process.